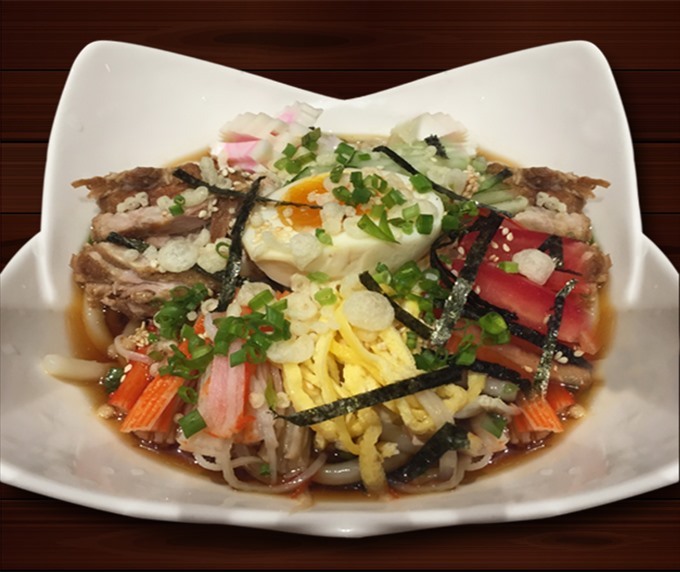 Mì Udon lạnh (Hiyashi Udon) is a favorite of children as it is not too spicy. Although noodles are a staple ingredient in Asian cuisine, the popularity of such dishes are not limited to this part of the world. 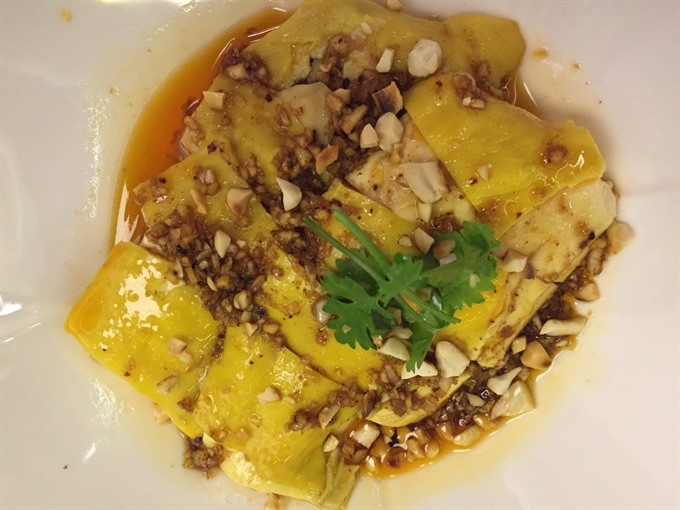 Mỹ Duyên reports on a HCM City restaurant that specialises in Thai, Korean, Japanese, Chinese and Vietnamese flavours. In the heart of downtown HCM City, the Noodle Noodle restaurant lives up to its name as it offers a wide variety of tempting Asian noodle dishes all in one place. Adjacent to the Times Square Building, Noodle Noodle is a two-story venue overlooking the broad Nguyễn Huệ Pedestrian Street. The restaurant’s eye-pleasing décor helps to set the stage for a satisfying meal featuring classic noodle soups from Japan, South Korea, Thailand, China’s Sichuan province, and Việt Nam. With such a variety, however, it can be hard to choose. 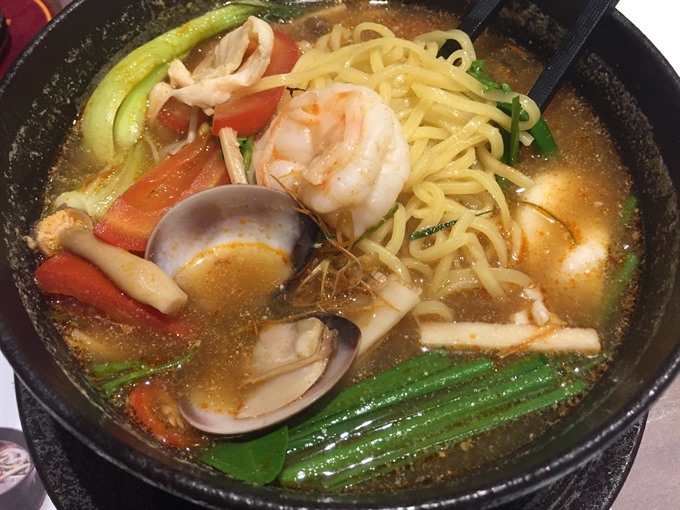 Should we have the Tonkotsu ramen from Japan or the kim chi BBQ pork noodle soup from South Korea, or the tom yum soup with seafood from Thailand? And what about the Hiyachi Udon from Japan or traditional Vietnamese phở with beef, chicken and seafood? After perusing the menu, we decided that multiple visits were in order. But for now, we would settle on our favourites. To give diners more options, Noodle Noodle has designed a collection of 10 appetizers that are specialties of the region. We adults chose the hotter versions of dishes as my children balk at anything that is even remotely spicy. I chose the chicken Zhong Qing-style (VNĐ138,000) and spicy wanton with pork and vegetables (VNĐ78,000), while my kids enjoyed the Chinese deep-fried prawns (VNĐ78,000) and Gillet pork chop (VNĐ68,000) for each dish. But what a surprise! My dishes, although good, were even too spicy for me! My kids, however, were crazy for the deep-fried prawns and pork chops, which had been recommended for those who like crispy foods. Coated with cassava powder, the prawns and pork were placed in a small wooden rectangular- shaped case that impressed my eight-year-old twins. “They crackle when I eat them,” my son said, while my daughter thought they were tender and juicy. To please my kids, I ordered Japanese pan-fried pork dumplings (VNĐ68,000), and I tried them, too. We both liked the not-too-spicy dish. It was the first time my daughter had tried the dish. “It looks simple but its taste is irresistible,” she said. Gà sốt cay Trùng Khánh (spicy chicken, Zhong Qing style) is a specialty of Noodle Noodle restaurant. Noodle Noodle has also added handmade dim sum to give diners more options. Since my twins especially like dim sum, they couldn’t pass up the delicious steamed shrimp dumplings (four for VNĐ78,000), their favourite. My daughter thought they were “so cute” and “tasty and fresh”. Besides the dim sum, we were anxious to try some of the 30 noodle dishes, which can be prepared to order, stir-fried or in soups, or at different levels of spiciness, as indicated by the number of chilis printed on the menu. The spicier soups were the Club Noodle Sichuan-style, which can include BBQ pork, fish filet, shrimp, shredded duck, mushrooms, vegetables or coddled egg, and the Korean-style Jajang-sauce noodle soup. The Thai seafood tom yum soup and Japanese beef shank ramen are not as hot. The best options for my kids were the Hiyashi Udon soup and Vietnamese phở with seafood at the flat price of VNĐ78,000 per bowl. Though phở is always my favourite, I wanted to try something sour and spicy, so I ordered the Thai shrimp tom yum (VNĐ118,000), while my friend chose the Chinese Dan Dan noodle soup (VNĐ78,000). A famous Sichuan street food, Dan Dan noodles are served in a savory, spicy broth topped with crispy minced pork, scallions and peanut flakes. I sampled my friends’ Dan Dan, which was delicious, and enjoyed the Thai soup with chewy noodles and broth with a stunning flavour thanks to the lemon leaves and savory ingredients. My daughter wasn’t disappointed with the Hiyashi Udon and its colourful garnishes and light flavouful broth. “The soup’s fantastic and not spicy at all,” she said. Comment: Central location, authentic Asian noodle dishes, cosy ambience and affordable prices (VNĐ68,000 – VNĐ138,000).